FAST TRACK Door-to-Door meet and greet service. Prices quoted are for a 4 seater. ALL Costa Blanca destinations available from Alicante airport (ALC). BOOK & SAFELY PAY DIRECT WITH THE SUPPLIER FOR TOTAL PEACE OF MIND. From only £17.75 per person when 4 share a private VIP upgrade transfer to Benidorm! 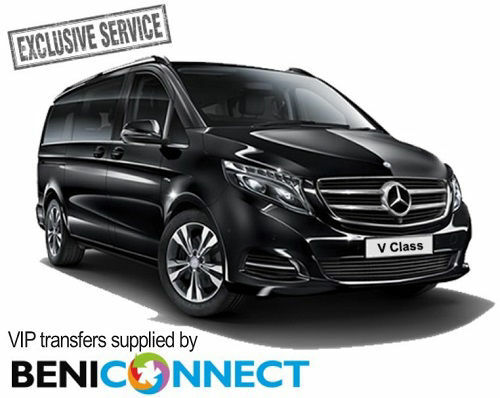 VIP Alicante Airport Private Transfers: A Door-to-Door meet and greet service with a smart upgraded car or people carrier. Locate your driver easily at the exclusive Private Transfer Desk located in arrivals immediately after exiting the baggage hall. Perfect for special occasions, couples and small groups of up to 7 passengers. Fast track your way to any Costa Blanca destination. NOTE: Benidorm VIP car transfers are via the motorway with a journey time of about 50 minutes. Simply pick the "VIP Private Transfer" option during the booking process. Actual vehicle Make and Model depends on number of passengers and availability.